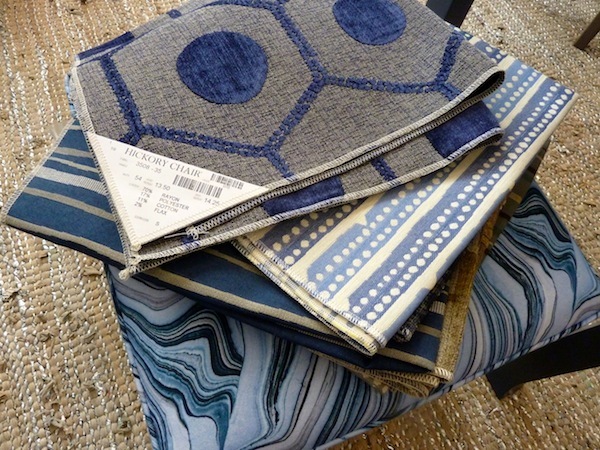 A variety of shades, all within the blue spectrum, make up this creative collection. 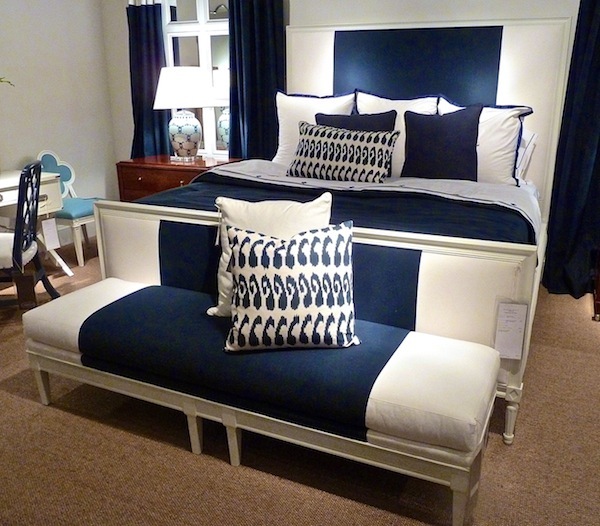 And in another corner of the showroom crisp graphic navy and white transformed one of Suzanne Kassler‘s vignettes. 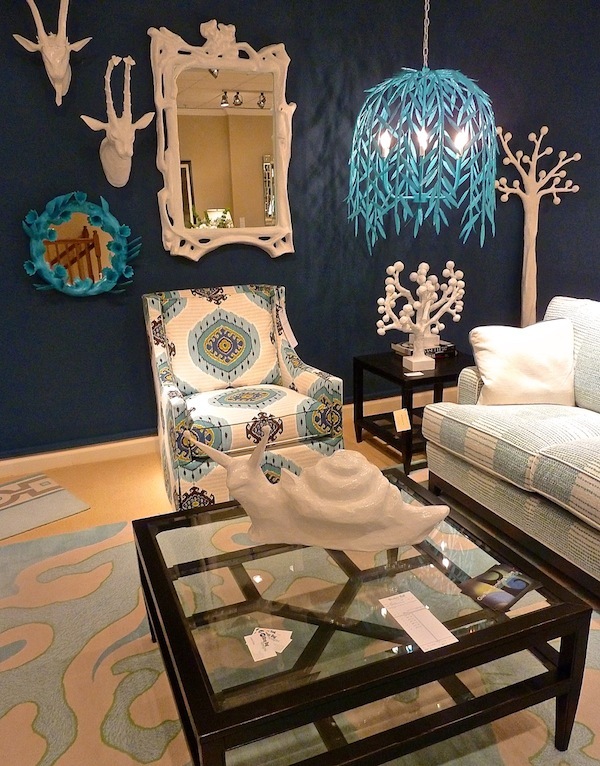 Wesley Hall has never been shy with color and this market offered an eclectic ode to blue upstairs in their market showroom. Pearson had quite a few terrific small occasional pieces. 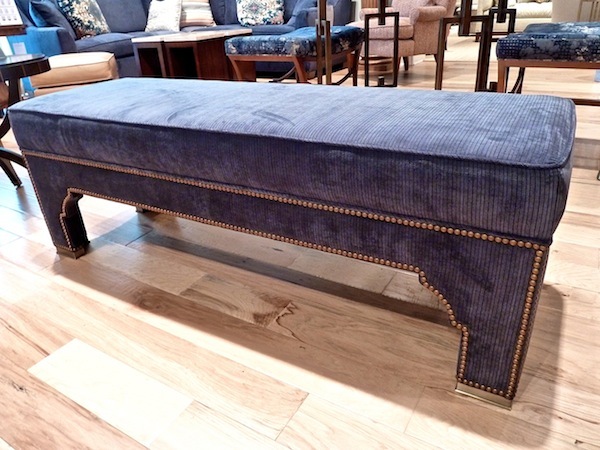 Known for their mostly proprietary fabric selection, Pearson presented these benches and ottomans with the Moroccan details so popular lately in texturally plush blue fabrics. I always love stopping into Van Thiel. Their passion for old furniture and accessories is evident in their selection of antiques and amazingly authentic reproductions. 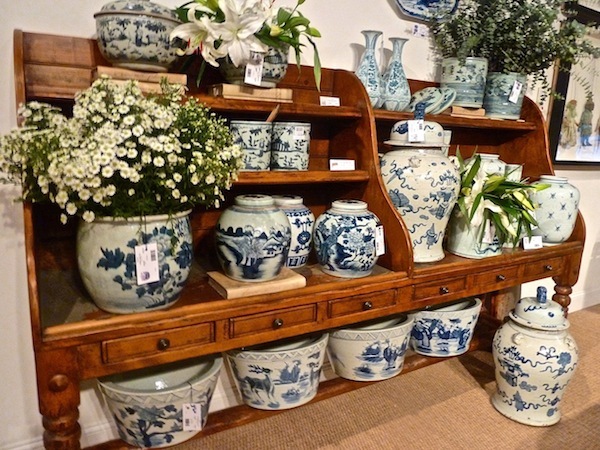 Their selection of blue and white ceramics is perfect for the season’s color story. 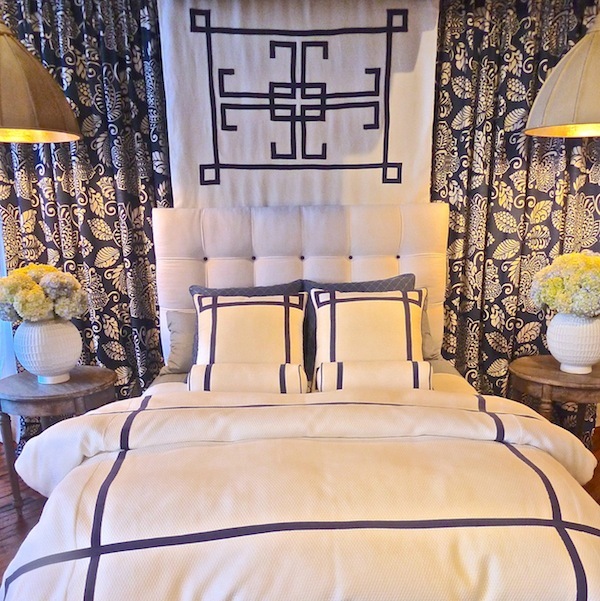 We’ll visit Thibaut‘s charming furniture collection that they introduced earlier this year at another time, but I had to share this elegant vignette featuring custom bedding in their showroom. 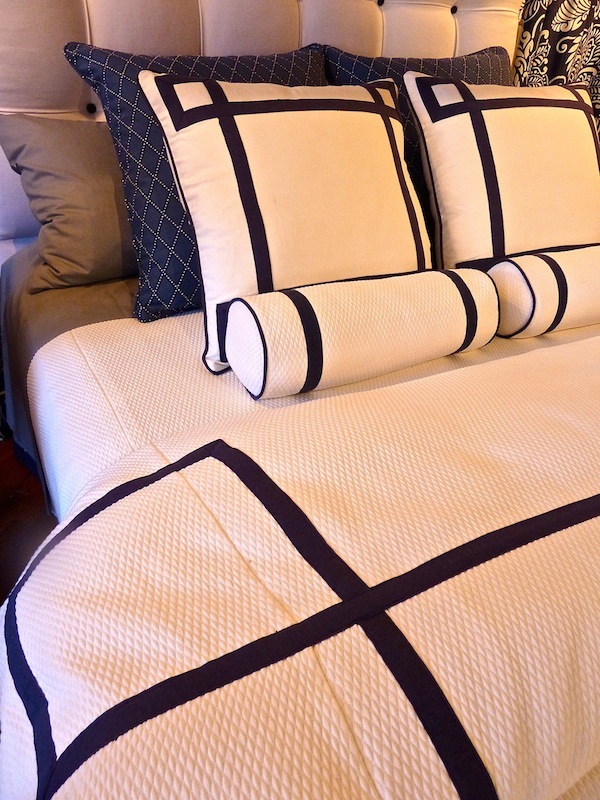 In a crisp navy and white scheme, it’s easy to see why their lovely matelassé is one of their most popular fabrics. 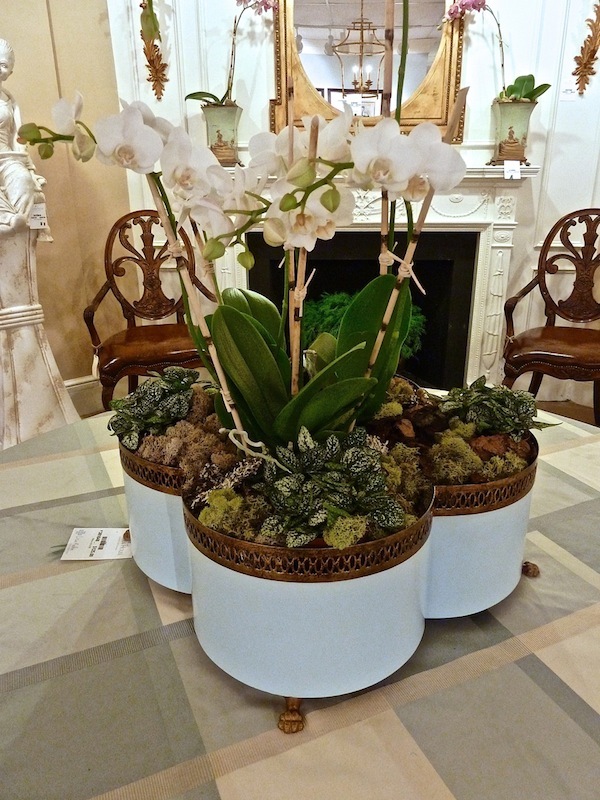 Award winning outdoor furniture designer Richard Frinier, about whom I have written before, showed a wide selection of his designs for Brown Jordan. 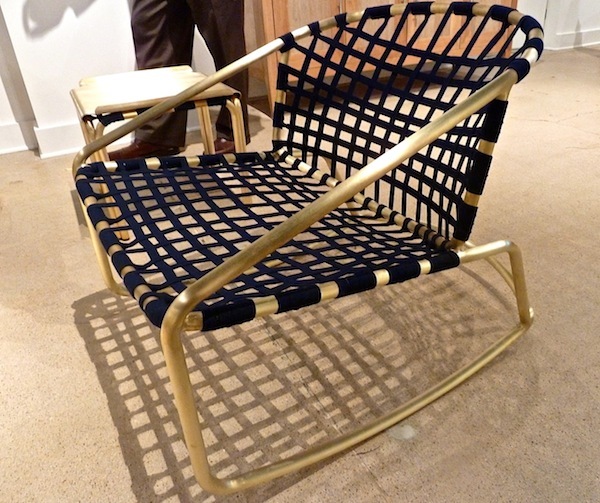 In addition to his own timeless classics, I just love his reworking of Tadao Inouye’s original Kantan chair, now shown with navy straps and unlacquered brass. Richard reinvigorated it for the line with a new fabric he helped engineer with Sunbrella that has an incredibly comfortable elasticity. 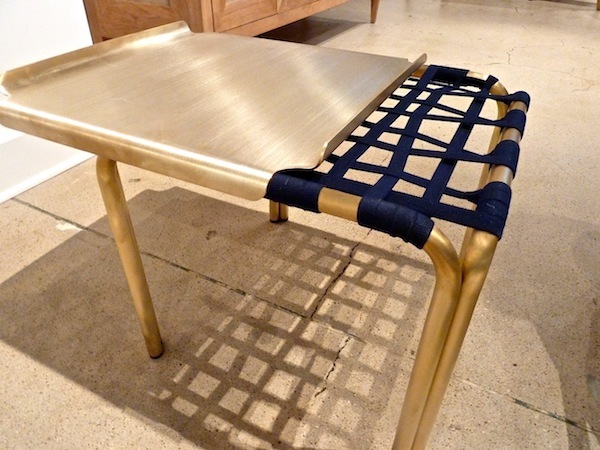 And for this reintroduction he created a clever and sophisticated side table with sliding, reversible or removable tray top – so chic and elegant! 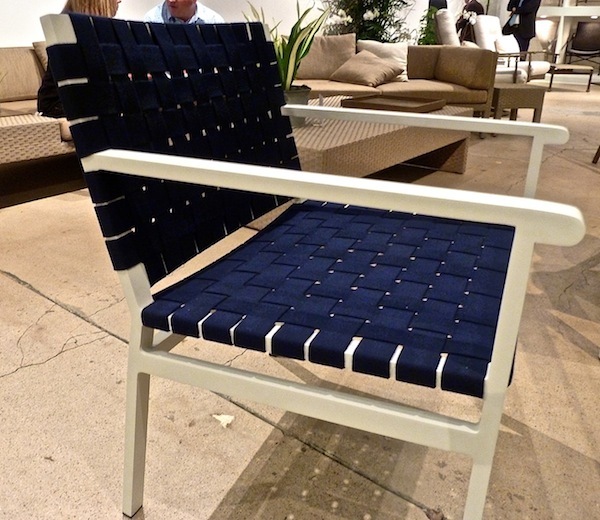 His Flex chair also looked sharp in the new navy Sunbrella webbing with a crisp white. Blue made a strong showing in decorative accessories as well including designer Lisa Kahn’s pretty new collection for Chelsea House. And lastly, I just had to include this shot of the ever fashion conscious Thom Filicia, whose new collection for Vanguard we’ll be visiting. His navy and white socks were just right for the theme. Do stop back soon as I’ll be reporting daily from High Point, D&D fall market and the tabletop show. There’s a lot of great design inspiration to share! This entry posted in design, furniture, interior design. 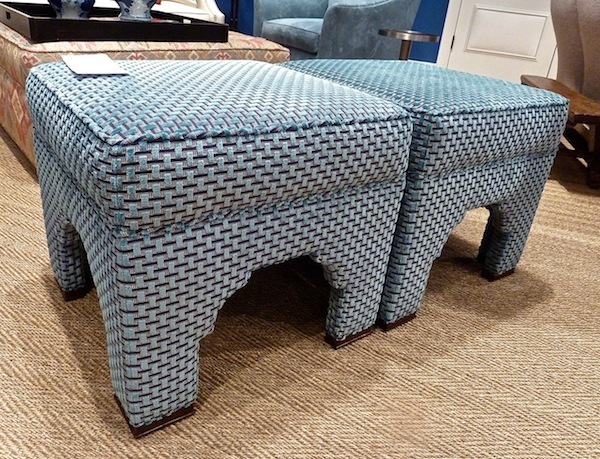 Entry Tags: Fabrics, Furniture, High Point Market, interior design Bookmark the permalink. I’m so glad that blue is back and brass accents also. There’s nothing like blue to make me feel clear and happy. LOVE the socks!! Can Brown Jordan do wrong? I think not. Thank you for sharing this beauty, Stacey. I was a fabulous market, no? Sorry we never got a chance to chat, I was too tired each evening to go to any of the parties. Yes, blue is definitely back! So much blue everywhere, and I love it! 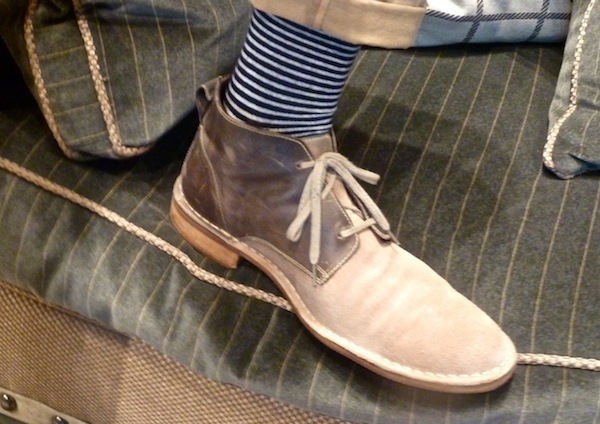 Great post, and love that Thom Filicia was wearing blue and white striped socks!! 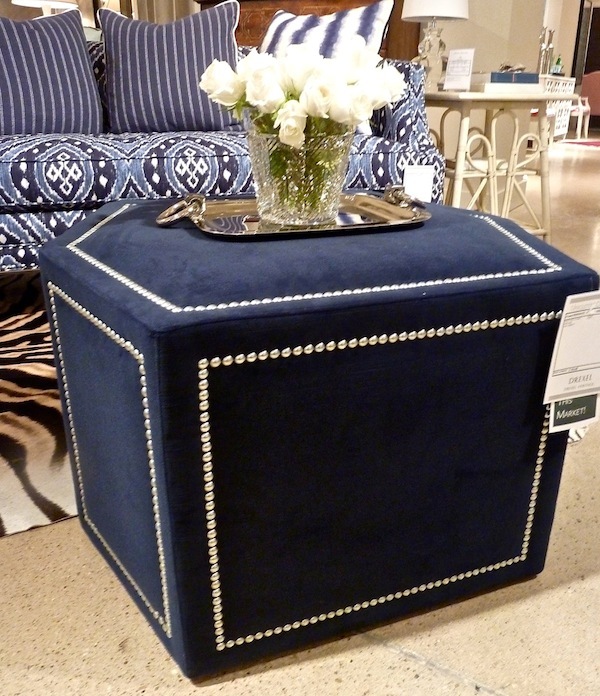 beautiful furniture and exquisite design! and i loved the story about what thom was wearing! 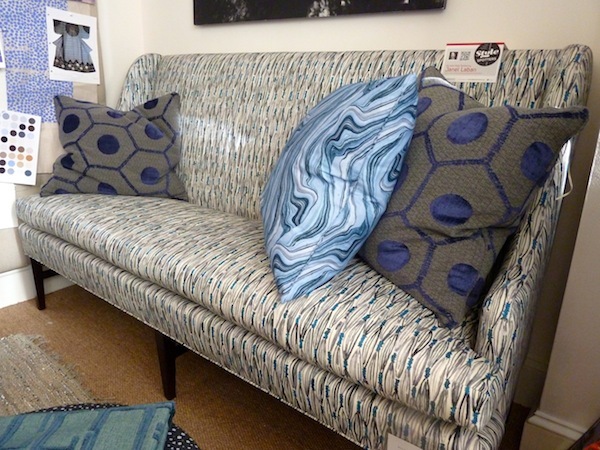 We’re always fans of the color blue and that marbelized fabric is fabulous! Will you be wearing the color du jour tonight? Looking forward to catching up! I never tire of blues! Thanks for these posts. I almost feel like I was there. I was honored that Wesley Hall was included in your beautiful roundup of the “Blues” of High Point. What great company we were in! As always, great post! Again I missed meeting you for which I am sad! 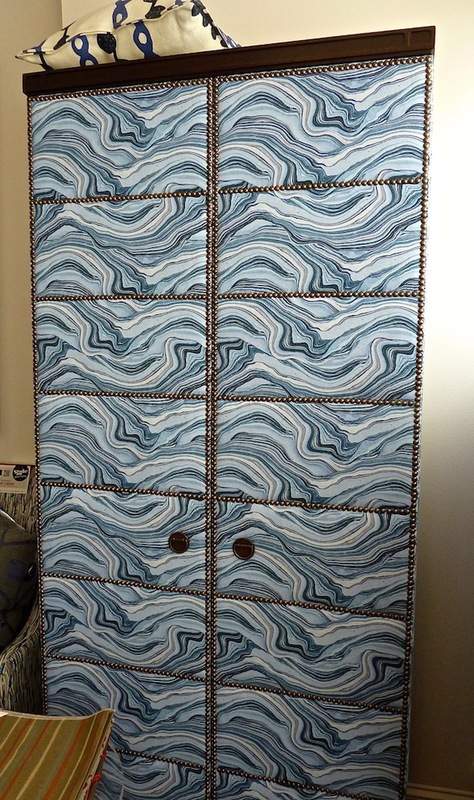 Loved all the lines you mentioned especially Lisa Kahn-Allen for Chelsea House! Just fab! Finally a High Point color that we can actually use in our homes! Orange was ok but used very sparingly. My clients are very happy with navy or dark blue from wall color to wall units. At first they look a little concerned about how dark it may be but then see how beautiful it will make the room look – if done correctly of course. I like this hue! Nice post, thank you. I love this post – I have a whole pinterest album dedicated to blue and white, and I am loving it more paired with Gold! 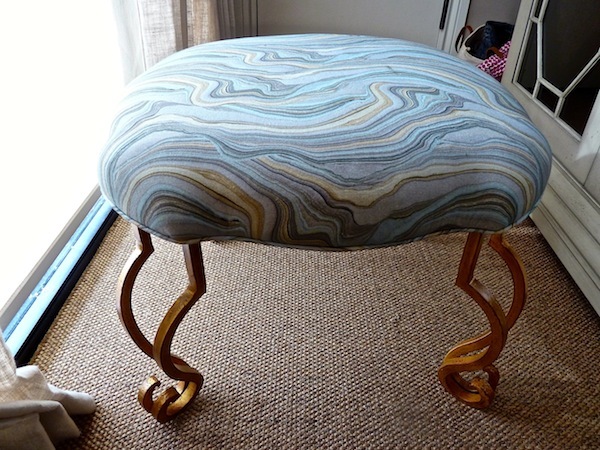 Thank you for your wonderful post about the amazing Hable Construction sister’s and their exclusive fabrics for Hickory Chair! Blue is back … especially shades of indigo. 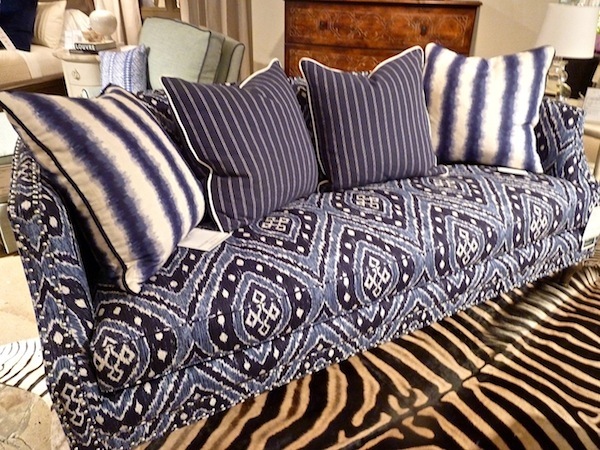 Their American designed, woven and printed fabrics are so unique and special. 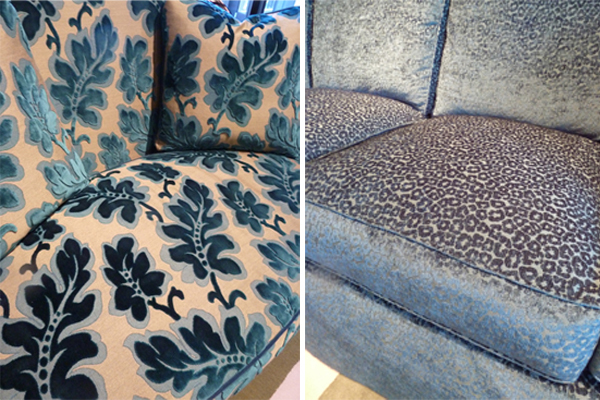 We are proud to upholster them on anything available with upholstery options in just a few weeks from order! We hope you can visit us at our workroom in Hickory, NC this fall! 78 queries in 0.741 seconds.